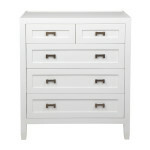 The clean lines and delicate contrast of finish make the Moreno an instant classic. The modern signature brass handles are truly a work of high-craft making the commode a true centerpiece of any room. Available in Chalk or Black.